What determines whether an egg is white or brown? What is the difference? The breed of the chicken determines eggshell color. The color of a hen’s ear area is the color indicator, with a white or light spot meaning white eggs. Usually, white hens lay white eggs, and brown hens lay brown eggs. Eggs that are not white have pigments deposited on them as the eggs travel through the hen’s oviduct. Blue and other egg colors are formed as the egg develops and the color appears on both the inside and outside of the shell. Brown pigmentation happens very late in the process and only appears on the outside of the egg. Eggs from various commercial breeds, may range from white to deep brown. Brown chickens are usually larger and require more food to make an egg, which is why brown eggs may cost more than white eggs. 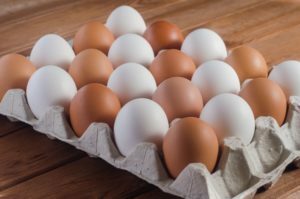 All eggs, no matter the color, are packed with protein and nutrients.